After learning more about the eight Cognitive Functions, I feel as though I can more accurately judge a person’s personality type after interacting with them, even if only for a short period of time. In the past, I approached personality typing with the mindset of identifying which letters matched a person’s observable behaviors. However, I later learned that this was a flawed approach. It is better to determine which functions (primarily the first two) a person uses most often with ease and to then associate those functions with the personality type they correspond with. In this post, I’d like to give a brief overview of the eight Cognitive Functions in Personality Psychology. Simply because I am an INFJ, I’m going to list them in the functional order that only INFJ’s possess. An INFJ’s order is (as you’ll soon see) Ni-Fe-Ti-Se and Ne-Fi-Te-Si as shadow functions. All 16 MBTI Personality Types have all 8 Cognitive Functions, although the specific order is unique for each type. That’s what makes each type so special. I promise I will try to keep this as simple as possible. Ni is primarily used by INFJ and INTJ. People with dominant Ni achieve a zen-like state of mind very easily. Unlike all other types, Ni users achieve total synchronization across their whole brain when asked just a single question or while tackling novel unfamiliar problems. They also go into this state when thinking about the future and making predictions. Many will enter a brief trance-like state to answer a problem. Ni users are generalists, as opposed to specialists, and extremely visual thinkers. They may appear to be staring off into space and oftentimes fail to realize concrete things in the world around them. Fe is primarily used by ENFJ and ESFJ. Fe types are concerned about social responsibility. Fe users excel in communication, evaluation of others’ behaviors, and they are masters of explanation and decision with a special emphasis on their core values. Those who use Fe suppress emotional impulses from deep inside their brains in favor of expressing sophisticated ethical and thoughtful responses. These responses are usually calm even when relating back to emotionally charged topics. Ti is primarily used by INTP and ISTP. People who use Ti show strong performance in the areas of the brain that handle complex and logical reasoning. Ti users have little trouble linearly deriving solutions, weighing pros and cons, categorizing, defining, and identifying. This type achieves a zen-like state of mind when meeting a new person, starting a new activity, or arguing. Ti-dominant types show the least interest in listening. Se is primarily used by ESTP and ESFP. Se users have action-ready brains that jump around quickly. People with good Se have brains that use little energy. Their brains are asynchronous and skip around. Se users are rarely surprised and are oftentimes alert and in tune with their bodies. In addition, Se users get bored very easily and show more activity when standing or sitting near a window than when sitting at desk against a wall. This type achieves a zen-like state of mind in a crisis, even if just pretending. Afterwards, Se types may experience a headache. Ne is primarily used by ENTP and ENFP. Ne is crazy. Ne users think fast and consume a lot of energy in the process. People who use Ne are super creative, excellent trans-contextual thinkers, and have asynchronous brains. They are excellent at seeing relationships that may not exist and are wonderful at brainstorming. Unlike Ni which is very much about seeing the meaning behind things, Ne is more so about seeing possibilities, recognizing talent, and generating ideas. Fi is primarily used by INFP and ISFP. Fi users achieve a zen-like state of mind while listening. INFP and ISFP make the best listeners of all 16 types, especially the INFP in specific. Fi users are very in-tune with how things make them feel emotionally, as opposed to Fe users who are more perceptive of how others feel. They have high activity in regions that dictate importance, oftentimes relating back to their core values. Fi types show the least activity in regions that aid logic (classifying, deducing, defining, etc.). Te is primarily used by ENTJ and ESTJ. People with developed Te have incredibly efficient use of mental energy. Te users are able to make educated decisions and excel as leaders. Many will choose action over accuracy. Te types are very focused on goals, task completion, error correction, and giving directions. While Ti is more about thinking things through, Te focuses more getting things done. Si is primarily used by ISTJ and ISFJ. Si types have a special ability to develop any region over long period of time, permanently etching skills into their brains. Their abilities are a reflection of their training and background. They make outstanding specialists. This type enters a zen-like state of mind when reviewing past experiences in great detail. Si users have a special talent for memorization, repetition, and analyzation of daily events. The Si user heavily relies on parts of the brain that respond to social feedback. This can have both positive and negative implications depending on context. CONGRATULATIONS! You survived our mini-psychology lesson. How does an INFJ beat their opponent? They stab them with their Ni-Fe! I’d love to know your MBTI type if you know it and perhaps any thoughts you may have about the 8 functions! If you don’t know your personality type, perhaps this list will give you a better idea of what your type may be! If you’re totally confused right now, leave a comment with the 8 functions in order from which one you associate with THE MOST to THE LEAST. From there, there’s a chance I may be able to guide you in a direction towards figuring it out! Please note that I am by no means a professional on this subject, just a curious college student! Reblogged this on Writing Prompts for Rookie Writers. Ouch. My brain hurts. This was too much like homework. It didn’t feel like a mini-psychology lesson to me, more like full blown. 🙂 After printing and reading through these several times, I think I have come up with my chronological list. Interesting! Looks to me like you might be an ENFJ! Have you ever taken the Myers Briggs Personality Type Indicator? Fe-Ni-Se are the first 3 functions of the ENFJ type! Would you consider yourself an extrovert? Hmmm. Very interesting. No, I have not taken the Briggs Personality Type Indicator. Yes, I would consider myself extroverted. (I think I annoy some of my close friends, by being so.) It’s just who I am. As I read more and more, I get happier and happier discovering and identifying with these little details. 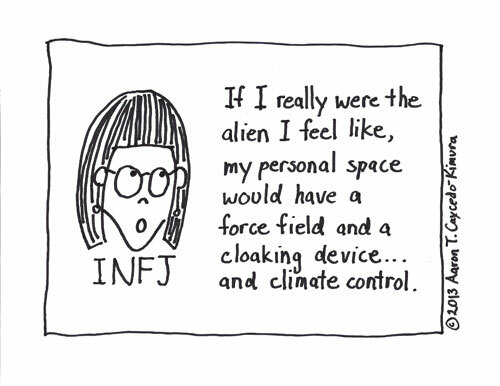 It’s funny because that seems to be common among INFJs but I personally don’t feel like I have my guard up when I’m with other people. I did google the ENFJ personality. Yes, it is pretty close to spot on for me. It’s amazing. There’s a lot in the description that I would never have really thought about but made me reflect. It gave me several of those nodding “uh huh” moments. Thanks, yet again. I had taken a few of online tests before and slight preference for ISTP over INTP. Interesting! 🙂 An ISTP. I haven’t interacted with many ISTPs on here! Well. I know for certain that I am a perceiving introvert. However, I am not sure about the other ones.